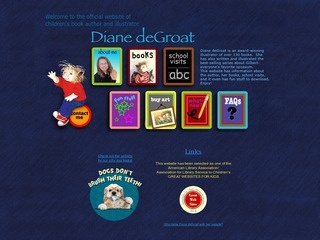 The official website of author/illustrator Diane deGroat who has published 120 books for children. This website tells about her, her books, school visits, and how you can purchase Diane’s original art. All information is approved by Diane. FAQs answer all of the actual questions Diane has answered during her school visits. Teachers and librarians will enjoy “Fun Stuff” which includes the following in various subject areas: coloring page, word search, connect the dots, mazes, and even a Gilbert paper doll with clothes.